These clinical trials are taking place in the new JRC adjoining the UCSD Shiley Eye Institute. 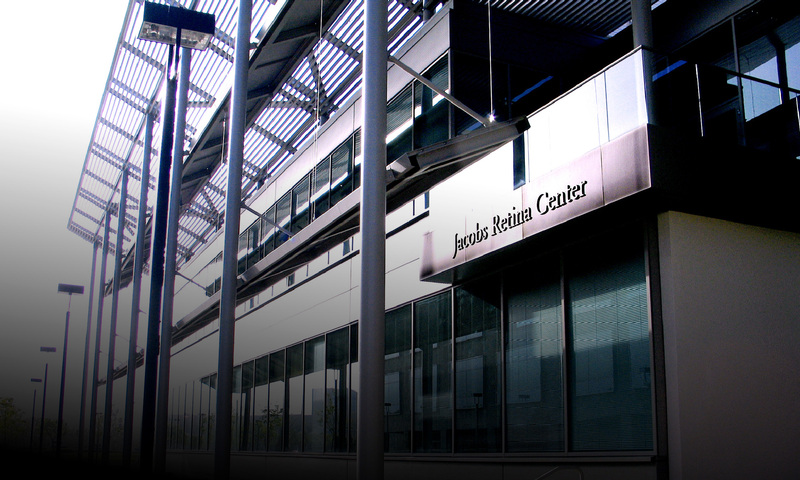 The Jacobs Retina Center is home to specially designed labs and clinical evaluation facilities as well as staff and faculty who examine, evaluate, and assess patients or participants of clinical trials. The rooms are equipped with specialized charts and equipment that test not only basic reading and vision capabilities but also take into account factors like contrast sensitivity. For example, a patient may not see the “E” on the black-on-white chart, known as the Snellen visual acuity chart, but that patient may see the “E” on a chart that is different shades of gray-on-gray. In addition, there are many specialized instruments that measure retinal function and structure in non-invasive ways. These instruments allow the researchers to study the response of the retina to new treatments. One of Freeman’s studies has been recognized as one of UCSD’s most promising translational research proposals by the UCSD Trans-Med Program, a partnership with industry to bridge the “translational gap” between traditional government-funded research and commercial development, in order to benefit the public by improving clinical care. This study is a partnership between Freeman and Michael Sailor, Ph.D., Professor, UCSD Chemistry Department. They are testing a drug delivery system that uses photonic nanocrystals that are injected into the eye to treat AMD, diabetes, blood vessel occlusions, and infections of the retina. These crystals act as containers for certain drugs and release the drug at a programmed speed. Doctors are then able to monitor the release of the drug by changes in color of the crystals. This process has safely been tested and the results are promising. One benefit of this delivery system is that the drug is applied only to the appropriate area of the eye, prohibiting any side effects to the rest of the body. Freeman is partnering with Genentech to conduct two clinical trials that involve treatment for Macular Degeneration patients. These studies involve monthly injections of a drug called Lucentis (also known as Rhufab). The drug is injected into the eye through an extremely fine needle. This drug is designed to stop the growth of the abnormal vessels that cause Macular Degeneration. Preliminary results show that some Macular Degeneration patients are seeing fairly small print. Again, this delivery method prohibits side effects to the rest of the body. Another treatment Freeman and his team are working on for Macular Degeneration is based on treating the feeder vessel, located under the retina. This study uses a laser to scan the retina at extremely high speed; each point of the retina is scanned in milliseconds, thus producing twelve to fifteen full retina images per second. The laser scans to find the feeder vessel under the retina. Once it is found, a photodynamic drug is activated by a laser in order to shut that vessel down and stop the blood flow to abnormal vessels. A Phase IIII protocol approved by the u.s. Federal Drug Association is implemented at this point whereby the drug dosage is raised until there is a positive effect. A study for treatment of Retinal Vein Occlusion tests a drug delivery system and involves the surgical implantation of a pellet-like form of a drug that releases steroids into the eye. This drug dissolves in the eye much like sugar dissolving in water, which takes place over about a two-month period. This method attempts to reduce the swelling of the retina caused by high blood pressure and/or diabetes. The new state-of-the-art facilities, funded by Joan and Irwin Jacobs, allow Freeman and his team the specialized clinical and laboratory space to find cures and treatments. In addition to Sailor, UCSD faculty members and colleagues who work with Freeman on new treatments and disease detection techniques include: Dirk-Uwe Bartsch, Ph.D., Gabriel Silva, Ph.D., Lingyun Cheng, M.D., Karl Hostetler, M.D., David Williams, Ph.D., and others.